It’s winter here in America, and as of this writing the northeast is buried under a couple feet of snow. Seems like a good time to drink something warm! Toddies have been around for a long time. In their most basic form, they’re essentially a sling—spirit, water, sugar—with an addition of aromatics such as nutmeg or lemon peel. The can be served hot or cold, but these days the name is synonymous with hot drinks. The etymology is unknown, though some believe it derives from Tadi, an Indian palm wine. They differ from another classic warm drink, the Negus, in that they do not contain wine. 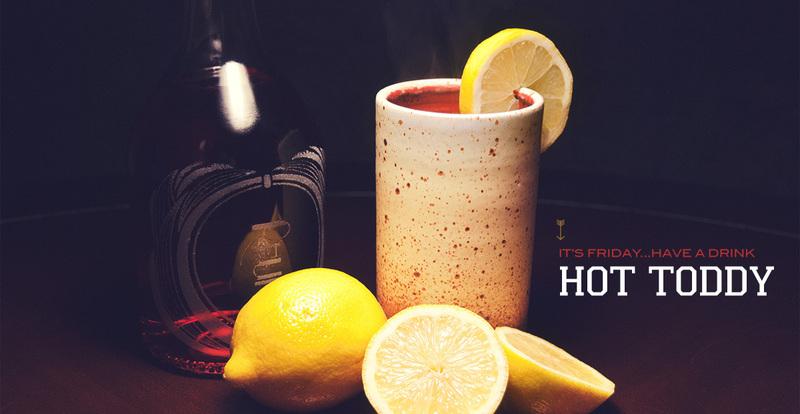 The Hot Toddy is a classic whose construction is heavily debated. Celebrated bartender Jeffrey Morgenthaler does a good job of summing it up in a blog post: basically everyone has their own idea of what a Toddy should contain, and early Toddy recipes are pretty boring. So, in the modern era, due to the addition of citrus and other flavors, they’ve become something more like hot punches. Purists can stick with their diluted brandy and sugar if they want, but I’m more on Jeffrey’s side: modern Toddies are better. Toddy recipes most often use honey, but I like maple syrup better, so I decided to go with that. It worked well. The maple flavor adds an interesting depth to the drink, as do the orange and Tiki bitters, neither of which are technically used in a Hot Toddy, but both of which make it that much more delicious. If you don’t have Tiki bitters, any aromatic (such as Angostura) will work. The real key here is to use enough rum and other ingredients so that you still have a rich, flavorful drink after adding the hot water. It’s easy for a Toddy to become a tepid, thin, boring drink if you’re not careful. To help avoid that, start with a pre-warmed mug, use lots of booze, and don’t worry about filling it to the top. A couple ounces of water are all you should need. Combine all ingredients except water and cinnamon stick in a pint glass with NO ICE and stir thoroughly. Pour into a mug. Drop cinnamon stick into mug. Top with boiling water, stirring gently. Garnish with a lemon wheel. This recipe is pretty hefty, I admit. You can always cut it in half! What about those cups? Where did those cups come from? If you don’t have bitters, I’ve found that using earl grey tea is a decent substitute! That sounds tasty. And certainly more flavorful than plain water!